For the money possibly the best engine built for it's time (1917-1937) Well constructed and when right every one starts exactly the same (even the 10HP) and runs like a clock. All "M's" are throttle governed and basically look the same. 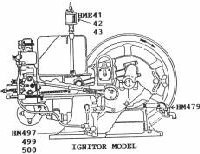 The 3 & 6HP had no major design changes, but did change the cylinder head and block casting to accommodate the ignitor or sparkplug ignition system. 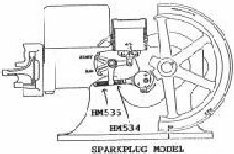 The early engines had ignitors (to 1921), then a switch to sparkplug with a rotary Bosch mag, and in 1924 Wico "EK" magnetos were introduced. 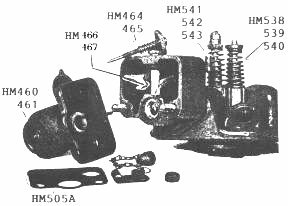 The 1-1/2HP ignition system, etc. changed the same as the larger sizes, but there was an additional change with the 1-1/2HP when IHC switched from Bosch to Wico EK mags. The cylinder block had a larger bore (3-5/8" compared to the smaller bore of 3-1/4" for the earlier blocks). Please remember there can be exceptions to anything. We have the experience to help you order the correct parts for your 'M'. IHC "M" 10HP Bearings, valves, all carb parts and piston rings now available. Please call or email for prices. Also, cylinder hear, carb, ignitor and magneto rebuilding available. A note on decal placement. The Globe decal goes on the flywheel side of the engine, the McCormick Deering or International decal goes on the pulley side. All fuel pumps are cast iron and tested before shipping.